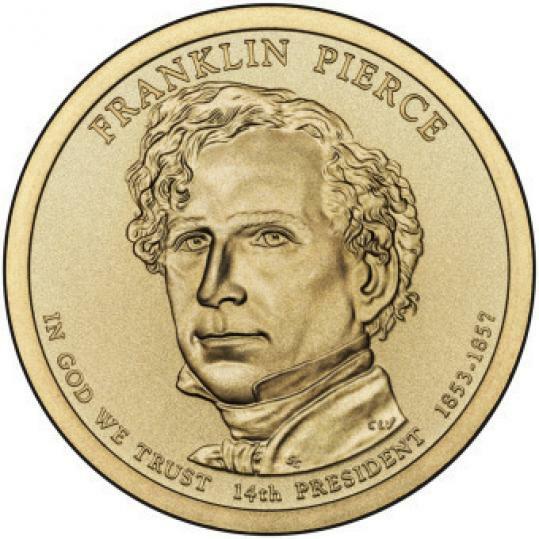 New Hampshire native Franklin Pierce’s likeness is emblazoned on the $1 coin. CONCORD, N.H. — The US Mint introduced a $1 coin yesterday bearing the image of President Franklin Pierce, a New Hampshire native who served from 1853 to 1857. The coin, the 14th in a series of coins honoring former presidents, features Pierce and his famously unruly hair on one side and the Statue of Liberty on the reverse. Pierce has often been written off as a weak leader who was wrong on slavery, the overriding issue of his time. But biographer Peter Wallner urged schoolchildren who attended yesterday’s ceremony to look beyond their textbooks to learn more about Pierce, whom he called a complex man with simple values. “Franklin Pierce isn’t often remembered today in a celebratory way, and that is too bad, because in many ways, he was an admirable and patriotic citizen and was a formidable military and political leader,’’ he told the crowd outside Pierce’s historic home. Pierce rose quickly in politics: he was elected to the Legislature at age 24, was named Speaker of the House at age 25, and by 32 had served in both the US House and Senate. As president, he ran one of the most corruption-free administrations of the 19th century, paid down 60 percent of the national debt and was on “the right side of history’’ on most major issues, from the temperance movement to westward expansion, Wallner said. The exception was slavery, Wallner said. Pierce abhorred it personally, but he was dedicated to upholding the Constitution and avoiding civil war. Most damaging to his presidency was his support for the Kansas-Nebraska Act, which allowed settlers in the two territories decide for themselves whether to allow slavery. It resulted in sometimes fatal clashes between pro- and antislavery groups in Kansas, further animosity between the North and the South, and more divisions within Pierce’s party, the Democrats. “For his failure to embrace the cause of emancipation and the civil war, his presidency and reputation are forever tarnished,’’ Wallner said. Legislation to create the presidential coin series was introduced in 2005 by John E. Sununu, a former senator from New Hampshire, and Senator Harry Reid of Nevada. “I tried to talk Harry Reid into starting with President Pierce; it was a very short conversation,’’ Sununu quipped in a phone interview. He said the presidential coins have become even more of a success than lawmakers or US Mint officials anticipated, and have built on the success of the state quarter program. Andy Brunhart, deputy director of the US Mint, attended yesterday’s ceremony and helped dump a bowl of coins on a table to display them to the crowd. “As these coins move from hand to hand and actually pass from generation to generation, they will connect us to our history,’’ he said. Beyond the educational value, officials hope use of dollar coins will become more widespread because they last longer than paper dollars, he said. Brunhart acknowledged it has been tough to get Americans to embrace the coins as everyday currency, rather than collectors’ items. Cait McAllister, 9, said she had no intention of spending the coin she and other children were given after the ceremony. “I’m going to save it,’’ she said.